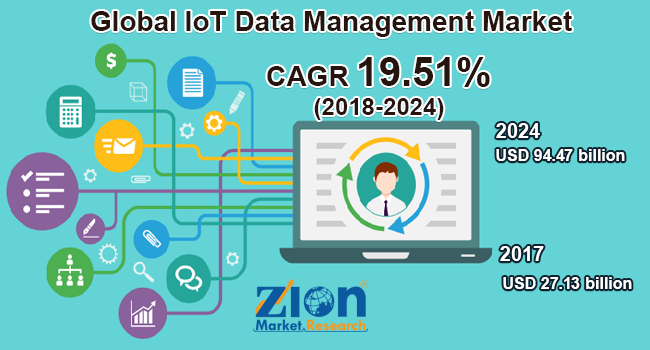 Zion Market Research has published a new report titled “IoT Data Management Market by Solution (Metadata management, Data analytics and visualization, Data integration, Data migration, Data security, and Others), by Services (Managed Services, Support and Maintenance services and Consulting services), by Deployment (Private cloud, Public cloud, and Hybrid cloud), and by Application (Smart manufacturing, Smart healthcare, Smart energy and Utilities, Building and Home automation, Smart retail, and Smart Mobility and Transportation, and Others): Global Industry Perspective, Comprehensive Analysis and Forecast, 2017 – 2024’’. According to the report, global IoT data management market was valued at around USD 27.13 billion in 2017 and is expected to reach approximately USD 94.47 billion in 2024, growing at a CAGR of slightly above 19.51% between 2018 and 2024. IoT (Internet of Things) can be summarized as a network of enormous electronic devices embedded with physical devices such as vehicles and ultimately controlled by software. IoT networks are designed with the purpose of transferring data without any machine or human interruption. IoT data management involves managing a large volume of data transferred by IoT technology. Currently, the IoT market is booming worldwide. IoT market is expected to grow at a rate of 20.9% from the year 2016 to 2019. Massive data is gathered with the help of IoT and there is an immense need of securing it. The rising demand for securing gathered data from cyber attacks is significantly driving the growth of the market. Moreover, managing voluminous data gathered from innumerable IoT devices is anticipated to act as an add-on to the market growth in upcoming years. Another reason responsible for flourishing the market demand is rapid adoption of data encryption for security of IoT-based devices. Increasing number of smart city projects has significantly accelerated the demand for IoT data management. In the year 2016, globally 252 smart city projects were accounted in which 29% projects were from the Asia Pacific. However, implementation of IoT data management requires high data transfer speed. Therefore, it can be implied only in the regions with uninterrupted internet connectivity. Challenges faced in implementation in rural areas are hindering the IoT data management market growth to some extent. Enormous opportunities are anticipated in the IoT data management market owing to its implementation in a smart building in order to gather and manage real-time information such as temperature, mechanical system, and energy consumption. Cisco Systems, Inc. has predicted that by the year 2020, IoT is anticipated to generate 600 ZB (Zettabytes) data annually. The IoT data management market is fragmented on the basis of the solution, service, application area, deployment type, and region. Based on a solution, the IoT data management market is bifurcated into metadata management, data analytics, and visualization, data integration, data migration, data security, and others. In the year 2017, the data integration segment attained a significant market share due to globally boosting demand for data integration tools for combining data from various sources. Based on facilitated services, the market is segmented into managed services, support and maintenance services, and consulting services. Managed services segment is anticipated to grow significantly due to rising demand for data management of IT services. Deployment segment is classified into a private cloud, public cloud, and hybrid cloud. Flourishing private enterprise sector is significantly driving private cloud segment growth. Application area segment comprises smart manufacturing, smart healthcare, smart energy, and utilities, building and home automation, smart retail, and smart mobility and transportation, among others. Based on region, the IoT data management market is segmented into North America, Europe, Asia Pacific, Latin America, and the Middle East and Africa. In the year 2017, North America dominated the IoT data management market. Boosting technological advancements and rapid digitalization among various industrial sectors are significantly contributing to the market in the region. IoT data management has recently emerged worldwide and rapid technological developments are implemented by major market players. Prime players of IoT data management market are SAS Institute Inc., Fujitsu Limited, Teradata Corporation, Dell Technologies, Inc., Oracle Corporation, Cisco Systems, Inc., International Business Machines (IBM) Corporation, PTC Inc., Hewlett Packard Enterprise (HPE) Company, SAP SE, and Google Inc., among others.